If I were Chris Eubanks, I would have a difficult time getting to sleep. Who can sleep when it seems like everyday could bring another milestone moment to a tennis career that looks to be loaded with potential. 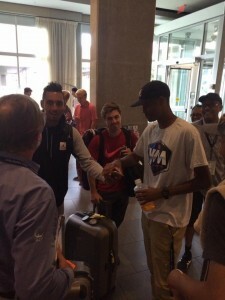 The Georgia Tech Rising Junior finished the spring as the ACC Men’s Player Of The Year.Then,two weeks ago,found himself in Portland, Oregon as a practice partner for the United States Davis Cup team. Spending 4 days working out with John Isner, Jack Sock, and the Bryan Brothers could be considered tennis summer school. It could also be an excellent way to tune up for his return home for the task that awaited him at Atlantic Station. 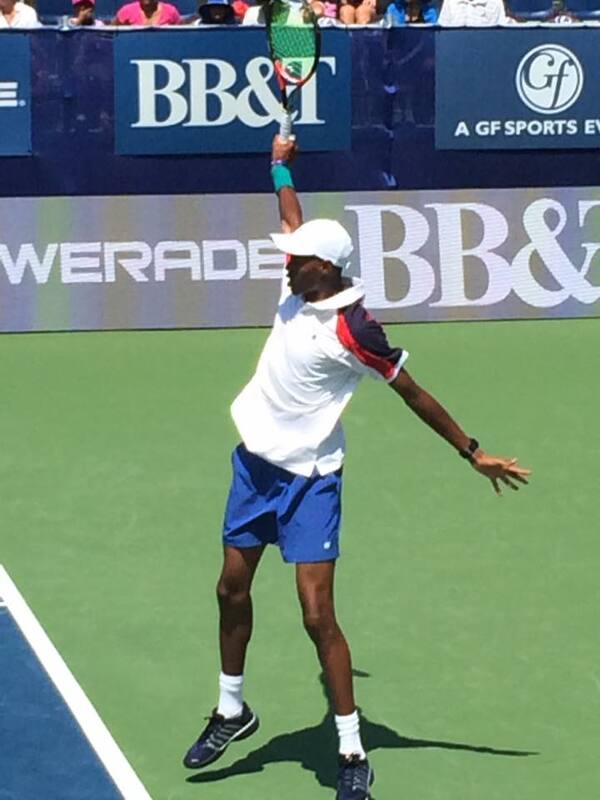 Now Chris Eubanks is more than comfortable on the courts with the ATP pros during their annual stop in Atlanta. 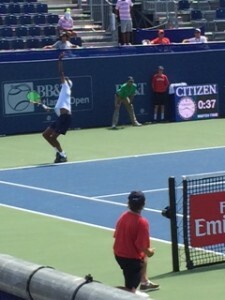 Eubanks was awarded wildcard spots into the qualifying round of the BB&T Atlanta Open going back to 2012 and 2013, while he was attending Westlake High School.Both times Eubanks fell to the guys who play the game for a living. Both times he would leave the court with a smile on his face,talking about what a good time he had and how proud he was to play in his hometown tournament. 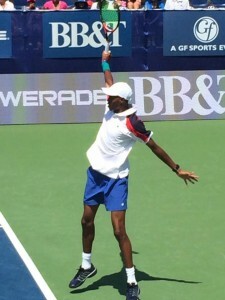 Last year Eubanks received a wild card into the tournaments’s main draw to represent Georgia Tech on College Night at the BB&T. His match was with Radek Stepanek, a seasoned veteran,who was once ranked among the top players in the world. Once again Eubanks suffered a set back, but it was also another chance to learn. After all ,Chris is a college student and campus is just a few block away. This summer the College Night main draw slot will go to UGA’s Austin Smith, and with a more talented field coming to Atlantic Station Eubanks would have to battle through two rounds of a Wild-Card Challenge just to earn a spot in the Qualifying Rounds for this weekend.Chris did it, but he didn’t stop there. 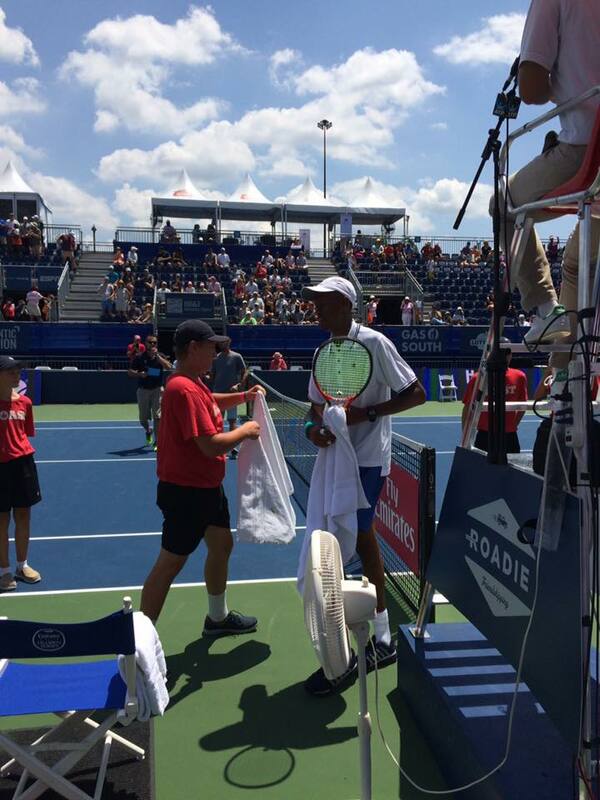 Eubanks swept through the qualifying rounds , beating the 2015 French Open Junior winner, and a player ranked #104 in the world. Now Chris Eubanks is beating those guys who play the game for a living , and was asked during an interview on 92.9The Game, When will you be ready to leave school and turn pro ? When you play the way Eubanks did this weekend it makes you popular with the fans, your coach, and the other players on tour. Rising ATP star Nick Kyrgios arrived in Atlanta, met the 6-7 Eubanks and asked where he might be able to find a good game of Round Ball. No, not tennis, but basketball, the Aussie is mad about the hardwood game. Wouldn’t you know it, Chris along with Kyrgios and 6-11 Reilly Opelka ended up with the McCamish Pavilion court all to themselves Sunday evening. So for the weekend not only was Chris Eubanks the king of the court but he was also the king of hospitality.You can best believe that the word got around to the other tennis player that Eubanks knows the guy with the keys to the gym. Monday night “The King of Hospitality” will be back at Atlantic Station playing with that smaller round ball, and Reilly Opelka will be on the other side of the net. The match is set for a 6pm start and could be the highlight of day 1 of the main draw at the BB&T Atlanta Open.